You and I stand just a few feet, and a world apart. You are the old lady in the restaurant who gave me a stern look, then elbowed her friends, so they could also stare at my daughter. You shook your heads in open disapproval. In your world, children aren't born 3 and a half months early, and they don't have life threatening strokes, therefore they have absolutely no excuse to be using a bottle at 4 years old. In my world, the fact that my daughter can take anything by mouth is both a miracle, and the result of years of painstaking effort. You are the irritable man at the Science Center who gave my children a blatant look of disgust when they had trouble staying in their seat during your presentation. In your world, parents are expected to control their children in public, and children have no excuse to behave that way. In my world, my children have ADHD and autism, which makes sitting still very difficult for them, even when they are on medication and are really trying to behave. You are the lady in the mall who rolled her eyes at me because my daughter was making too much noise. In your world, parents should teach their children to use their "inside voice." In my world, the fact that my daughter can make any vocalizations at all is really amazing. Her left vocal cord is paralyzed from nerve damaged caused by a chest surgery which was done when she weighed less than 2 pounds. In my world, not all children are capable of understanding the concept of an "inside voice." You are the neighbor who notices with dismay that my yard doesn't look quite as manicured as it once did. In your world, there is time and energy to put in to things like that. In my world, I am too exhausted to care much about the yard anymore. I have bigger concerns that consume my days and nights, important things like trying to teach my 4 year old how to communicate her basic needs. You are the fair weather friends I once had, the ones who simply evaporated while I struggled for months to cope with having a critically ill child. In your world, friends are only worth having if they are always fun to be around, and aren't likely to need anything from you. In my world, friends don't need to be asked. They can see you need help, and are quick to offer it. You are the checkout lady in the grocery store who said to me, "I am SO glad that isn't my kid," not realizing that it was my own son you were commenting to me about. He was having a meltdown, and my husband was taking him out of the store, while I checked out as quickly as I possibly could. In your world, children with special needs are a curse. You pity them, rather than value them as people. With your eyes, you see only their deficits. 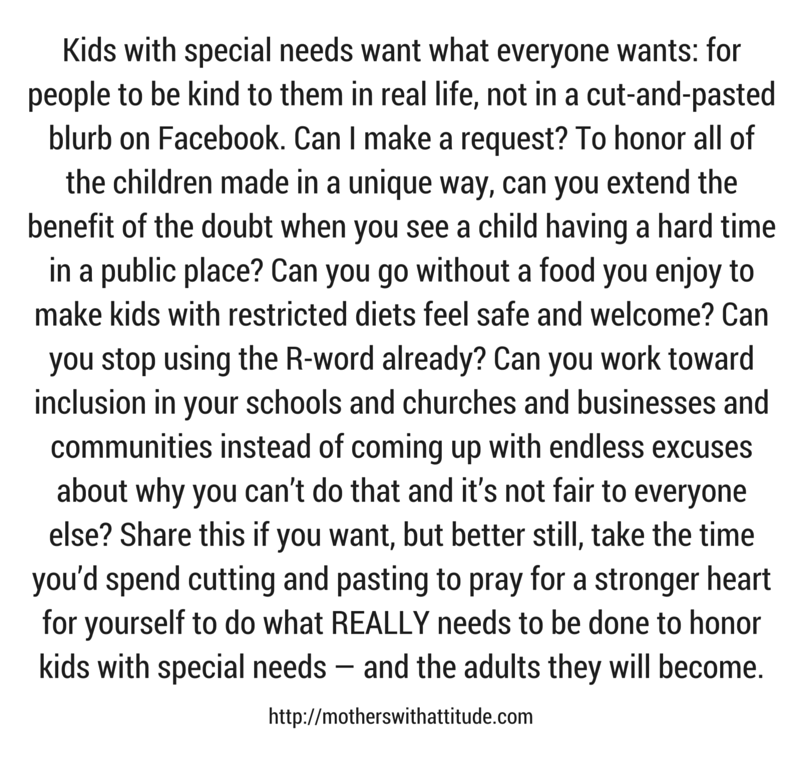 In my world, special needs children are a blessing beyond measure. They teach us invaluable lessons in gratitude, patience, faith, and the value of life. With my eyes, I can see the miracles you sadly fail to see. You are all the people who smugly pass judgment on us. I know most of you do so without knowing all the facts. I realize you measure our behaviors by the only rules that you know, the rules that govern your world. You can not know how deeply your thoughtless responses cut. On most days, I extend to you a courtesy you fail to give us. I silently pardon, and excuse your behavior. Because you do not live in my world, I know you can not begin to fathom how hard my children work to try to meet the expectations of your world, and that they are doing the best they can despite their challenges. I both forgive, and sometimes envy you for your ignorance. To the special needs parents who read this, I would like to invite you to join my Facebook support group for special needs parents "Loving a Miracle -- Special Parents Supporting Each Other." If the link fails to work you can copy, and past it to your browser. Permission to repost/reprint: Individuals and Facebook groups have my permission to post a link to this note within Facebook. If you would like to obtain permission to post or reprint this note outside of Facebook, please send me a message. Thank you. Read more from Kristina Smith Blizzard on her blog, Loving a Miracle.